Venezuela : Neither Maduro nor Guaidó ! Accueil > Internacional > Américas > Venezuela : Neither Maduro nor Guaidó ! Neither for the working class of Venezuela nor for the Venezuelan people, Maduro or Guaidó represent "the path of democracy and social progress", against what their supporters affirm, including the governments we face. Imperialist intervention of the United States (supported by the Group of Lima and the European Union), which is behind the self-proclamation of Guaidó, is as unacceptable in Venezuela as any other imperialist intervention in any region of the world. Maduro regime denies the most basic liberties ; represses and assassinates those who resist and, more broadly, the poorest population. The ruling clan has diverted the country’s wealth to its benefit. For the International Labour Union Network of Solidarity and Struggles, the task of the internationalist trade unionists is not to choose between two oppressions, nor to legitimize or excuse one of them. 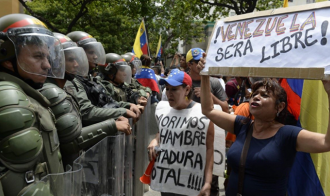 We support those who are trying to build an alternative in this dramatic context, those who are struggling to respond to the social emergency facing the Venezuelan people (food, housing, wages, labor legislation, public services, democratic rights, etc.). People do not want Maduro anymore and nobody has chosen Guaidó ! Neither capitalism nor bureaucracy ! Neither oppression nor imperialism !